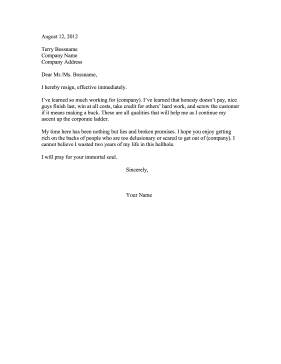 Intended for humor and perhaps stress relief, this bridge-burning resignation letter should be used with caution and only if the user never intends to ask for a reference. I hereby resign, effective immediately. I've learned so much working for (company). I've learned that honesty doesn't pay, nice guys finish last, win at all costs, take credit for others' hard work, and screw the customer if it means making a buck. These are all qualities that will help me as I continue my ascent up the corporate ladder. My time here has been nothing but lies and broken promises. I hope you enjoy getting rich on the backs of people who are too delusionary or scared to get out of (company). I cannot believe I wasted two years of my life in this hellhole. I will pray for your immortal soul.